Post Falls, Idaho vacation rental condo. Enjoy beautiful river views near shopping, dining, and entertainment. 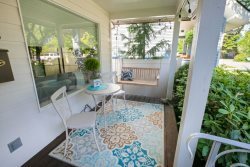 Salmon Run Condo is a gorgeous home that offers unobstructed views of the Spokane River. Whether you’re relaxing out on the spacious balcony or looking through the many large windows, you’ll feel immersed in nature’s tranquility. The main living area features an open floor plan with plenty of light streaming in. The fully stocked kitchen offers all of the comforts of home, including ample space for preparing meals. Plush chairs seat 4 at the kitchen counter and the adjacent dining room table seats 4 more. The dining area seamlessly flows into the cozy living room that’s complete with a fireplace, TV, and comfy leather seating. You’ll also find access to the spacious deck. This large covered deck will be a favorite spot to spend time, whether you’re enjoying your morning coffee or unwinding with a glass of wine. You’ll find high-quality seating, a great BBQ, and absolutely beautiful views of the Spokane River and surrounding mountains. When it’s time to rest, three bedrooms and two full bathrooms await. Offering a queen bed and TV in the room, you’ll begin each day on a great note when you wake up to the scenic views outside the floor to ceiling windows in the master bedroom. The attached master bathroom features double sinks, a glass shower, and a separate soaking tub. Two other spacious bedrooms with queen beds and great closets can be found nearby. The second bathroom has a large glass and stone shower and tons of counter space. You’ll also have access to a washer and dryer in the unit. When you’re ready to get out and explore, you’ll love the central location only minutes from great restaurants, breweries and public parks in Post Falls, ID. Plus, downtown Coeur d’Alene’s shopping, dining, public beaches, and entertainment are a mere 15 minute car ride away. This central location makes it easy to enjoy all that the Inland Northwest has to offer! Overall the condo was clean, and a great location for going to Spokane or anywhere in Idaho. Had a great time exploring the nearby places. The water view was great and the unit is very quiet. The view of the water as soon as you open the door. Good location was close to everything. Finding VRA managed property online was easy. Working with the VRA rep is a joy. Quick phone calls and emails. I knew what to expect and what was expected of me. The view is superb and the deck seating area with the fireplace is super cozy. I also thought the living area seating was nicely done. Not only was the Salmon Run property clean, modern and ideally located, it couldn't have been easier to coordinate with the help of Vacation Rental Authority. I was sent the key code for the gate as well as for the condo avoiding the need to meet someone at a certain time. Simple, convenient and so easy.